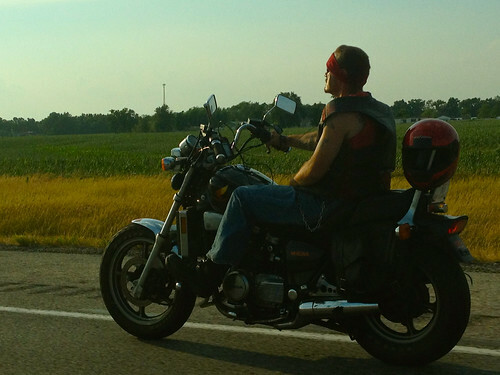 We spotted this guy westbound on I-90 as we crossed Indiana on our way to Grand Beach, Michigan, for our annual Fourth of July vacation. I understand that lots of bikers don't wear helmets, but I'm pretty sure that if you've got one, it should be on your head. This was a very hasty capture with the iPhone while moving, and the image quality suffers a little bit from the digital zoom, but I'm pretty happy with the composition, light, and the fact that I caught the moment at all.